life just keeps getting busier and busier! Anyways, I finally have a moment to put it up, and so I hope you enjoy. A dear friend of mine took me out to a fairly popular Cheesecake cafe over a month ago. I love chocolate cheesecake, but hardly ever order it, because I’m always disappointed… there is one particular chocolate cheesecake recipe that I adore and it’s hard to compare any other to my taste buds. Anyways, I ordered a piece of their chocolate cheesecake, and sure enough I was not impressed. You know when you have an idea of a certain taste, and then you’re disappointed because it doesn’t even taste close to how you thought it should? Well, that’s exactly how I felt. And it was a $12.00 piece of cheesecake! Yes, you heard right, $12.00!!! I guess the upside was that it inspired me to make the chocolate cheesecake I love. It’s a great recipe from the “Joy of Cooking” Cookbook and boy is it tasty. Of course, me being me, I had to revise the recipe just a little bit :). 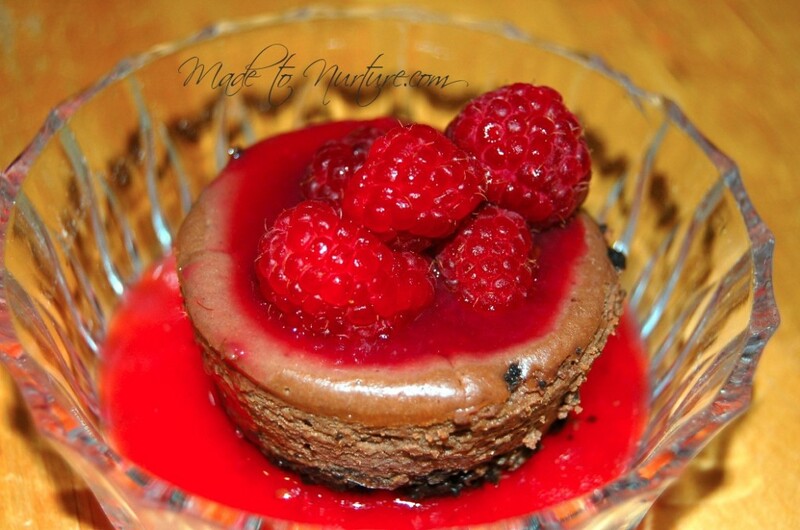 My favourite topping on chocolate cheesecake is fresh raspberries topped with Raspberry coulis. Mmmmm…. my mouth is watering just thinking about it. This cheesecake is so good, that even my sister-in-law, who doesn’t like cheesecake, thought it tasted yummy 🙂 She even took seconds when asked! 3 1/2 cups raspberries if frozen, thaw first. Prepare your Chocolate crumb crust. Preheat oven to 350 degrees F Lightly grease muffin tins with butter or oil. Melt butter on low in a saucepan. With a fork, mix in the chocolate wafer crumbs and sugar until all the ingredients are moistened and well blended. Scoop about 1 tablespoon into each slot of a muffin tin. Press down firmly. Sprinkle grated chocolate onto each cookie crust (optional). Bake until crust is firm to the touch, about 7-12 minutes. While waiting for the Chocolate crust to bake, place 8 ounces of finely chopped bittersweet/semi-sweet chocolate into a small bowl. Pour 1/3 cups of boiling water into the same bowl and stir until the chocolate is smooth and all melted. In a large bowl, beat cream cheese until it is smooth (30 - 60 seconds), scraping sides and beaters when done. Gradually add sugar and vanilla. Beat until smooth and creamy. One at a time, add your eggs, scraping sides of bowl and beaters after each is added. Next, beat in 1 tbsp unsweetened cocoa and 2 cups sour cream. Add in the warm chocolate mixture and beat on low until it is well blended. By this time, the chocolate crust should be ready to be taken out of the oven. Fill the muffin tins, leaving about 1/4" from the top. Turn off oven, leaving oven door ajar, and let the cheesecake cool in the oven for about 1 hour. Remove from oven and make sure tin is completely cool before placing in the fridge. (You can remove each little cake before placing in the fridge or leave them in the muffin tin. Just be sure each cake is completely cooled before removing from the tin). Cover and refrigerate for at least 6 hours. 24 hours would be better, or 48 hours will provide rich, intense flavour (believe me, it's worth the wait). Top with fresh raspberries covered in raspberry coulis. Place water and sugar in a saucepan over medium heat. Stir until all the sugar is dissolved. In a blender, puree the raspberries and sugar water together. Strain through a fine mesh sieve or cheesecloth, to remove all the seeds. I love the combination of chocolate and raspberry. These sound divine! This looks delicious! I’ve never tried making my own cheesecake but I love it! It’s super easy to make and tastes so amazing! Oh my! This is so my type of dessert. Looove it! Wow!! These look amazing for V-day. This looks delicious. I may have to make it. It’s funny, chocolate is my “thing” but I never order the chocolate cheesecake either, for the very same reason as you. It’s always disappointing. This recipe looks great though. I just might try it! Wow. The hardest part for me would be to let it sit for a bit. Yeah, right. That’s not gonna happen in my house! Thanks for sharing! Yes, it’s hard to let it sit… that’s why I make them into smaller portions. Some to eat right away and some to “age” in the fridge for a couple of days. (It’s definitely well worth it!) Hope you enjoy the recipe & thanks for the comment!